Welcome to summer! We hope this newsletter finds you enjoying the longer days, abundant sunshine, and a chance to relax and reconnect with friends and family. We’re excited to share with you another important milestone in our winemaking journey: this year marks the release of our fifth vintage of single-vineyard designate Cabernet Sauvignon wines. 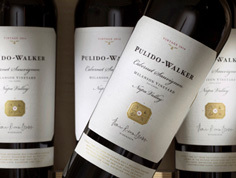 We can hardly believe it’s been five years since our inaugural 2010 Pulido~Walker vintage—and they have been very busy years! In 2014, we partnered with our winemaker, Thomas Rivers Brown, and the Dotzler family, proprietors of Outpost, to create a new winery for the production of Pulido~Walker wines. Mending Wall is a winemaker’s winery—built to Thomas’ detailed specifications and requirements, and consistent with our desire to craft exceptional wine. Our partnership in this new winemaking facility enables us to maintain complete quality control over every detail of production. The addition of optical scanning technology, for example, allows even greater precision in selecting the very best berries for Pulido~Walker wines. Another long-awaited milestone in our “Pursuit of the Possible” is the planting of our Mt. Veeder Estate Vineyard. With the guidance of a top viticulturist and climate scientist, we gained an in-depth understanding of what our site offers. Over the course of five years, we collected and analyzed weather station data and studied more than a hundred soil pits on our property. Our research informed the varietals and clones that Thomas Rivers Brown meticulously selected. Nearly a decade after acquiring the Mt. Veeder Estate, we determined the best 15 acres of the 115-acre estate for planting our own first growth vineyard—75% to Cabernet Sauvignon and 25% to Chardonnay. We look forward to the maturity of these vines. When that time comes, the same exacting standards and dedication to quality used on our Pritchard Hill and St. Helena wines will be applied to the crafting of singular Mt. Veeder Estate wines. 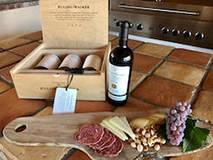 Robert Parker characterizes the 2014 Pulido~Walker single-vineyard designate from the higher elevation site of Melanson Vineyard on Pritchard Hill as “…a beauty…Black raspberry, blueberry, white flowers, forest floor, graphite and camphor are all present in the aromatics and flavors of this full-bodied wine that has magnificent fruit purity and an expansive, large-scale mouthfeel, but no heaviness or cloying characteristics.” 97 points. —The Wine Advocate, #227, October 2016. We celebrate the release of our extraordinary fifth vintage of Pulido~Walker Cabernet Sauvignon from Melanson Vineyard in August. Shipments will begin in October, weather permitting. 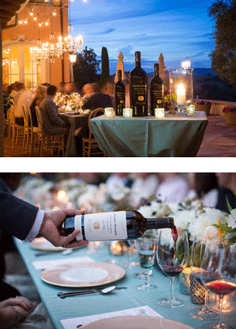 On Friday evening of Auction Napa Valley (ANV), we hosted an intimate vintner dinner at our Mt. Veeder Estate. Twenty-five guests were treated to a five-course meal prepared by Chef Sean O’Toole of Napa’s acclaimed TORC Restaurant, featuring such delicacies as Bluefin tuna O-TORO with Osetra caviar, Hudson Valley Foie Gras (so amazing that it’s hard to describe—it included the best corn ice cream sandwich you can imagine!!! ), 60-day dry-aged beef rib, and a spectacular explosion of mignardises after dessert. The evening began with a 2014 Rivers-Marie B. Thieriot Chardonnay followed by a rare five-vintage vertical tasting of the single-vineyard Pulido~Walker Cabernet Sauvignon wines. It was a treat for all of us to see how the vintages are developing and experience the results of our patient “Pursuit of the Possible” from our inaugural to the current release. Guests enjoyed tasting as Thomas Rivers Brown eloquently described the luscious wines. The backdrop for the dinner was a spectacular view of the sparkling lights of Napa and our estate vineyard. The Napa Valley Vintners (NVV) announced that Auction Napa Valley 2017 raised $15.7 million for children’s education and community health nonprofits during its weekend of feverish bidding at the annual celebration of the best of America’s leading wine region. To date, the NVV has given more than $170 million in Auction proceeds to Napa County nonprofits, serving more than 100,000 clients annually. Another remarkable achievement thanks to the generosity of vintners, community volunteers, and wine enthusiasts! Our Mt. Veeder Chardonnay blocks of “old Vine Wente” and “Montrachet” clones are through bloom and the berry set has been established. We are beginning to see small berries, about the size of a pea, forming on the clusters. Our Cabernet Sauvignon ENTAV clones 169, 685, 15, and FPS 30 “See” have also gone through set and although the berries are not quite pea-size, they are beginning to grow as well. Interesting to see the difference in phenological stages between the Cabernet Sauvignon and Chardonnay at this time. The last block of grafted Chardonnay vines from B. Thieriot Vineyard have now broken bud and are beginning to emerge from behind the protective cartons which we placed on the young vines to prevent damage from nosy critters. 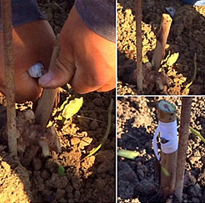 We will let those grafted vines grow much taller before training. The 2016 vintage of Pulido~Walker Estate Olive Oil continues to be highly awarded, having recently earned a gold medal in the Napa Valley Olive Oil Competition. The virgin olive oil was also a triple gold medalist at the YOLO Competition, winning golds in the following categories: Medium Intensity Tuscan Blend, Best in Class for Medium Intensity Tuscan Blend, and Best in Show for all Medium Intensity EVOO.